The cash envelope system may be the secret ingredient to help you finally gain control of your finances. It can help you escape the paycheck-to-paycheck rut, pay off debt, and stop overspending. We are keeping it simple today with a crash course: Cash Envelopes 101. I’m sharing a simple guide to understanding what the cash envelope system is, why it works, and step-by-step instructions on how to start implementing this envelope budgeting methodology. The cash envelope system is a cash-based budgeting and spending method. A predetermined, budgeted amount of cash is placed in several envelopes. Each envelope represents a different category in your budget (but don’t worry – you don’t have to make an envelope for ALL your budget categories). As you spend throughout the month, you take the cash out of the appropriate envelope to pay your bill. The cash envelope system requires you pay using cash (duh) – credit cards or debit cards are not allowed. If you don’t have any cash left in the envelope, you cannot make your purchase. Why does envelope budgeting work? Cash envelopes allow you to SEE your budget. No longer is your budget just numbers on a worksheet or spreadsheet. Your budget becomes a physical wad of cash that actually disappears as you spend it. It’s a constant reminder that you have a limited amount of money to spend. This is very different than credit card spending when it can seem like you have unlimited spending power. It’s pretty easy to forget that you are on a budget when it’s so simple to just swipe your credit card. You simply can’t overspend. If there is no money left in the envelope, you are forced to face the fact that you’ve blown through your budget. You’ll likely spend less money. There have been many studies that show that people who make purchases with cash spend less than those who use cards. Using cash makes you think twice before making a purchase. You are forced to create a budget. If you don’t budget, you won’t know how much money to put in each envelope. Without money in your envelopes, you…you…you…don’t have any cash to buy stuff! 🙁 It’s really easy to skip a month (or two, or three) of budgeting if you are using credit cards, but it’s impossible if you are using the cash envelope system. There is simply no way around it. To be successful with money (whatever that means to you – pay off debt, take yearly vacations, retire early, stop living paycheck to paycheck, etc. ), you need to create a budget. You need to know how much money you are bringing in (income) and how much money you are spending (expenses). You can learn how to create a budget on my budgeting 101 post. Cash envelopes aren’t an excuse to bypass a written budget. You need to know how much you can put in each envelope and a budget (like the monthly budget you can download in the box below) can help you do that. You aren’t going to carry around 20 or 30 envelopes representing each category in your budget. It’s just not practical. Using the budget you created in Step 1, identify the categories that to make cash envelopes for. This post on recommended cash envelope budget categories will help you choose which budget categories to make envelopes for. I recommend choosing 5 to 7 envelopes for the categories that you struggle the most with. Do you always over-spend at restaurants? If so, make a restaurants envelope. Cash envelopes are best for variable expenses like entertainment, groceries, restaurants, personal care, etc. Fixed expenses, like rent/mortgage and internet, do not need to be in a cash envelope. You will likely pay the same amount on these bills each month. This is the fun part (yay! finally adding some fun to budgeting). You need to decide how you are going to organize and store your cash. You can DIY your own cash envelope system or you can buy a wallet designed specifically for the cash envelope system. Biweekly or weekly (great for if you get paid biweekly or weekly). If you choose this, you may want to consider creating a biweekly or weekly budget (instead of a monthly budget). Once you have set your budget (Step 1), selected the categories for your envelopes (Step 2), chosen the type of envelopes or wallets you are going to use (Step 3), and selected your budgeting period (Step 4), it’s time to fill your envelopes with cash! You can’t use your credit card or debit card. Even if you are short just a couple of dollars. If you run out of cash, you can’t stop by the ATM to refill the envelopes (that’s just cheating!). Refilling envelopes can only happen at the beginning of your budgeting period. Decide if your leftover funds will be carried over to the next month (similar to the sinking funds concept). If you don’t spend all of your gift envelope money, are you going to leave the money in the envelope for the next month(s)? Determine where your “extra” money will go. If you haven’t spent all the money in your envelopes, and you are not leaving that money in the envelope for next month, what are you going to do with the extra cash? Are you going to put it towards your debt snowball? Will you put it towards a savings fund? Decide if you are allowed to “take” money from one envelope. If you have money leftover in your groceries envelope, can you transfer that money to the restaurants envelope (or something else)? Generally, you should really try to avoid this. You will get the most benefit from the cash envelope system if you don’t transfer money between envelopes. But, you may have an exception to this rule for a certain budget category and you should determine that before you begin. Remember, you can use different rules for different envelopes. As you spend money throughout the month, take cash from the appropriate envelope. I find it very helpful to keep a mini spending log for each envelope so that you can track your expenses. For each expense, write down the date, place of expense (store, activity), amount spent, and balance. Calculating the balance helps you know exactly how much money is leftover in each envelope at any given time without having to count it. When using paper envelopes, you can just write the spending log on the back of the envelope (some pre-made envelopes already have a spending log template for you). If you are using a special wallet or clip system, you can just write the spending log on post-it notes (have one post-it note for each envelope/category). Who can benefit from the cash envelope system? You will make every excuse in the book not to use the cash envelope system. But those excuses are preventing you from sticking to your budget and costing you hundreds, potentially thousands, of dollars. Or, for someone who is in a relationship with a person that matches a description above! Related content: Cash Envelope System Myths Debunked! Have you ever heard the phrase, “personal finance is personal“? I believe that to my core. Everyone has different personalities, habits, wishes, tendencies, goals…we are all so different. And that is why there are so many different ways to budget, spend your money, and save your money. I don’t think there is a “best way to budget”. That’s because the best way to budget is different for each person. I do believe that the cash envelope system is a great way to start budgeting. It gets you acquainted with your money, familiar with your spending habits, and aware of your money pitfalls. I also believe that the cash envelope system is a great place for those who have failed at budgeting month after month. For those people that have tried every budget spreadsheet and budget trick out there. 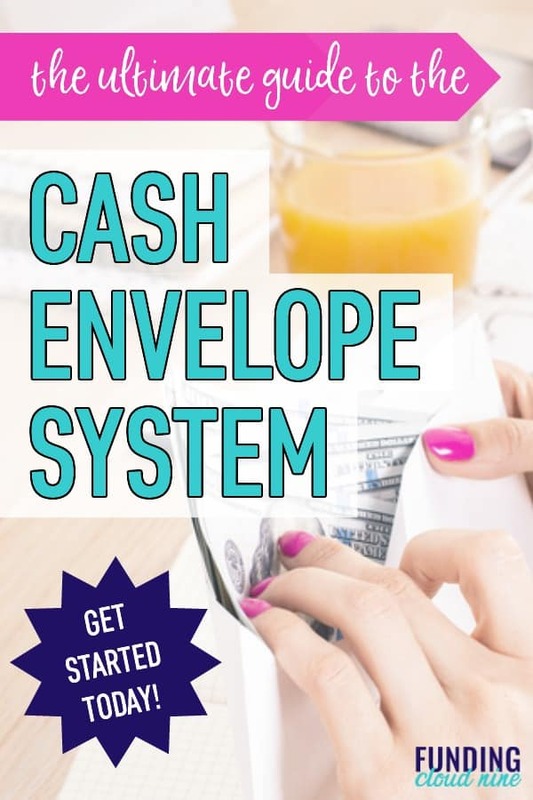 Have you tried the cash envelope system? How has it helped improve your financial life?